When you experience a devastating water damage situation in your North Charleston home, you may think that there is no coming back from this. You might look at your belongings swimming in floodwater or water from a burst pipe and think that everything is going to need to be tossed. However, water damage restoration companies like Clean Masters can actually restore many things that you might think are a lost cause. Here are some things a water damage restoration company can repair. It is nearly impossible for someone who is not a professional to tell how much damage has been done to the flooring. Most floors have several layers of subfloor and other materials underneath the wood or carpet, and it is difficult to say what has been damaged and what hasn’t. It is important to get your flooring seen to as soon as possible to make sure that it is dried completely and that mold doesn’t have a chance to grow in it. A restoration company can vacuum out all the water, dry it with their industrial dryers, and ensure that it is completely dry with thermal imaging technology. And in the cases that there was too much damage to the flooring to dry it out, these companies can replace the damaged floors and subfloors. When you have a burst pipe or a roof leak, many times the surface that takes the biggest beating is the ceiling or the walls. Water can get into the plaster and have a difficult time getting out. Even if the walls and ceilings are dried completely they could be bumpy, the paint could have peeled, or there could be a large gaping hole. In these cases, the restoration company can patch the hole, sand, texture, and repaint. When the professionals are done with their job, you won’t be able to tell there had been any damage. Did you know that restoration companies don’t just restore the interior of your home? They can also restore furniture that has been damaged by water. Wood is especially susceptible to water damage and should not be left sitting in water for an extended amount of time because the water can penetrate through the finish if it hasn’t been regularly refinished. Upholstery can also become very damaged since dirty water can get into the fibers of the fabric and stuffing. 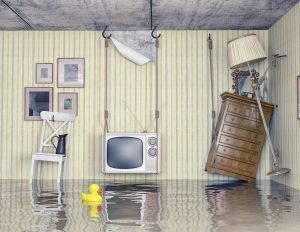 If water has gotten to your furniture, whether it be wood or upholstery, make sure you ask your water damage restoration company to take a whack at fixing it up. Water damage can be quite devastating and overwhelming when it happens to you. Luckily, you have a water damage restoration company you can call when things get dicey. If you have any kind of water damage that you need to have repaired, contact Clean Masters in North Charleston right away. They will come over and give you a consultation on what they can repair and what needs to be replaced.